Evil Dead: The Musical written by George Reinblatt produced by Black Button Eyes at the Pride Arts center feels unlike many theatrical experiences I’ve had before. It’s directed by Black Button Eyes production’s leading director Ed Rutherford, who knows how to stage the supernatural. The patrons coming in were all buzzing full of energy, excited to be sitting in the splatter zone. Some were wearing safety glasses to protect themselves from fake blood while others had on all white, prepared to embrace the messiness of the show, as rock music blared through the speakers. 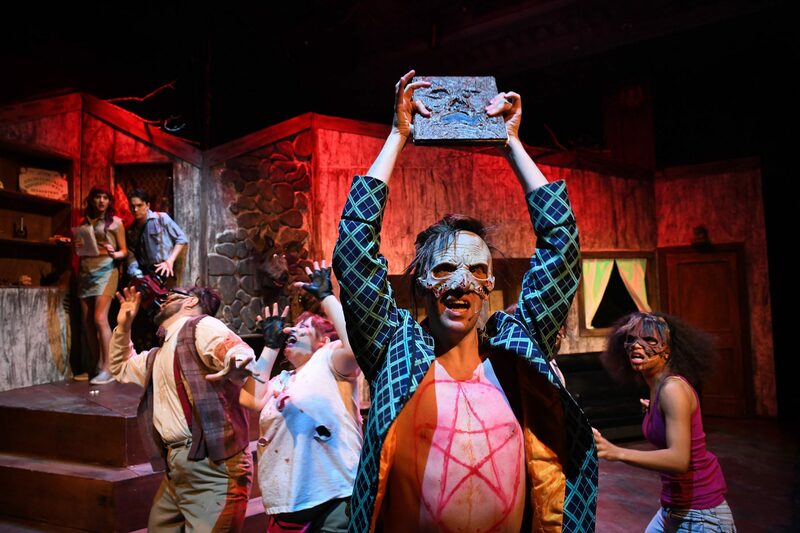 Evil Dead is satire – think A Very Potter Musical – mixed with a little bit of outrageous campy bloody humor. It combines all the films from the Evil Dead franchise into one musical that comments on the films’ writing inconsistencies with humor. The original film series may not be for everyone, but it does have a wildly devoted cult following. The best and most interesting thing about the show was the audience that came craving interaction. They came to get dirty. They came to hum and silently sing along with the music. This audience of many ages and backgrounds gave the show electric energy. It was then that I realized this show is for the ride or die Evil Dead fans; I just happened to be along for the ride. In a way, the show both succeeded and failed the audience and my own expectations. It’s the actors in this show that really have to sell both the cheesy and horror aspect of this musical. The comedy and gore relies on them alone. There were a few specific actors who shined in their interpretations of their characters. Caitlin Jackson who played Cheryl was a delight and a horror to watch. Her part demanded a lot of comedy and physicalization. Robert Quintanilla who played both Ed, a southern country man and the famous wall moose, was playful and captivating in each role. Shane Roberie as the constantly interrupted Jake was also able to hold both annoyance and a hunger for flesh. Speaking on a hunger for flesh; Violence in this show is skillfully staged (fight and gore design by Jon Beal). The show’s writing uses violence as humor more than tragedy. I’m still unsure sure how I feel about this much intense violence being made fun of, since it can be hard to stomach limbs spurting blood and the notion of intense pain. Yet, it was well done and there were a lot of clever tricks the director (Ed Rutherford) and the set/props designer (Jeremiah Barr) worked out to make each gag a success. The staging of actors and furniture allowed the illusions to be kept at almost every seat in the house. I was also pleasantly surprised by the band (Oliver Townsend, Henry Altenberg, Cali Kasten) who often stole the show. I almost wish they had even more of a presence in the show, perhaps a place onstage instead of being hidden upstairs. This might have also have added to the overall campiness and atmosphere. There were also many gags the typical theatregoer would appreciate planted throughout the show, like adult actors playing the trees in the woods, fun fight choreography, and the random musical numbers. Yet, these things also slowed down the pacing of the show. One too many gags and songs made the musical too repetitive. Without innovation and more audience interaction, the camp aspect often made the show lag. Black Button Eyes does give Evil Dead it’s due justice, but it does feel like the safe route was taken through only sticking to the text. Why not take everything to the extreme with more blood and more obvious cheesiness? This show isn’t groundbreaking in its themes and form but it can be fun, if you let it. I would recommend this production to anyone who’s a fan of gore, camp, and the Evil Dead Franchise. Evil Dead The Musical is produced by Black Button Eyes and runs at the Pride Arts Center until February 16th.